I am a third year Biology and Spanish major at Loyola. I have been lucky enough to travel growing up so upon entering college, I knew I wanted to study abroad. 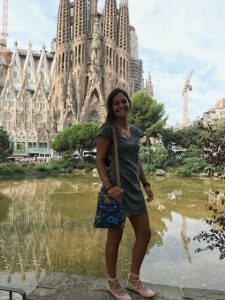 The Spanish language and its phonetics continue to intrigue me and Spain’s passionate culture and amazing architecture have always been one of my long-time ambitions to experience. Loyola’s partnership with SLU Madrid simplified my planning so I am finally achieving my dream to immerse myself in Spanish traditions. I am looking forward to speaking Spanish with more confidence and fluidity while really experiencing Spain through a local’s perspective. Thanks for checking out some of my adventures! Hey guys!!!! I’m so excited to share my travel experiences with you all, thank you for reading! I hope I can inspire you to see this beautiful world, please don’t ever forget, to travel is to live. Travelling to Spain was something that I dreamt of for years. I have learned about the language and various traditions since the 7th grade, and now I would finally be immersing myself in the beautiful country where all the culture has flourished. 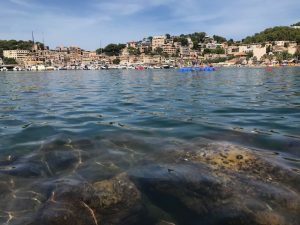 Even before my semester began in Madrid, my friend, Michael, and I took a trip to Barcelona and the island of Mallorca…and I absolutely fell in love with both. Our Airbnb hosts were incredibly nice, which was already a great impression of the Spanish people. The first half of our trip was spent at the island. Our Airbnb apartment was right off a main street in the city center, Palma. We lived right across a beautiful bakery, with Gaudí-esque architecture. We spent time exploring the city center with all the beautiful avenues marked with shops, bars, bakeries, and restaurants. 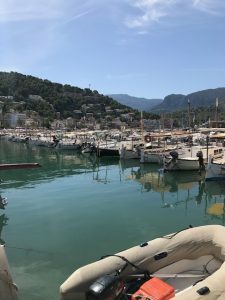 But one of the highlights was a beach called, Cala Major, where I stepped into the world of my Pinterest boards and all the travel pictures that I pin, read and dream about. It was truly magical. 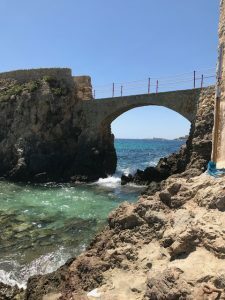 This beach paraded crystal clear waters of the Mediterranean as well as amazing sea cliffs that Michael and I swam through to get to the other side!!! Super adventurous and definitely worth getting up close to these rock formations. 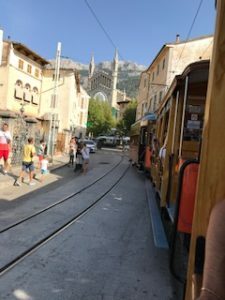 Another highlight of Palma was a town called Sóller. Yet again, I felt shaken in a positive way, and I was left in disbelief at the postcard views that were before me. My dreams were becoming a reality. I was no longer the dreamer living off of my Pinterest board to feed my travel bug, but I was transforming into the Pinner who inspires others to travel through their pictures and experiences. Sóller is a harbor so there were boats all over complimented by colorful architecture on the mountainside of the U-shaped shoreline. It was completely breathtaking. Our next stop on this end-of-the-summer adventure was Barcelona. And, once again, I fell in love. But this time, with Gaudí. 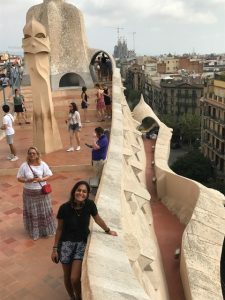 I could write a novel about our time in Barcelona, from the gigantic Gothic cathedrals to the churros & chocolate to Gaudí’s incredible masterpieces to the Olympic port and beaches. However, I will keep my focus on Gaudí. The Catalan architect, Antoni Gaudí, definitely made his mark in the city of Barcelona. 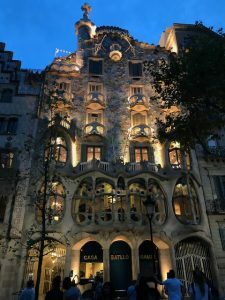 Of Parque Güell, La Casa Batlló, La Sagrada Familia, and La Pedrera, I have to say La Casa Batlló was my favorite Gaudí building. 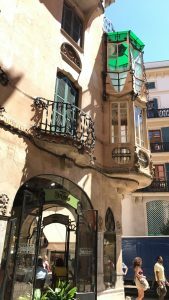 The entire design, like a lot of his art, was inspired by the sea where the iron balconies mimic seaweed and the colorful building itself is constructed of all curves and waves; absolutely no straight lines. To get to La Sagrada Familia, Michael and I took the train-even though you will hear this time and time again, let me just say, the metro system is SO, SO easy to navigate in Barcelona. It is fast, easy, and cheap. I remember coming up the escalator to the street of La Sagrada Familia and as I turned around, there it was. This giant masterpiece. I had absolutely no words at all. I was in awe. The carvings are just marvelous and so detailed. It takes a mastermind to not only imagine, but create such a treasure. I am beyond grateful for this start and I cannot wait to share about my experiences in Madrid, where I am finally studying. Spain has already left me speechless as I lived my Pinterest dreams.